The Women of the Church at Robinson Memorial is a group of dedicated ladies who meet on the third Tuesday of the month at 10:30 a.m. in Fellowship Hall. 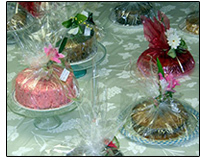 We are a service organization that participates in a wide variety of church related activities and many special events during the year, including the popular Bake Sales in the fall. The Women are famous for their homemade chicken pot pies and other specialties. We seek the membership of all ages and welcome all women and encourage everyone to join us for spiritual growth, sharing with one another and our many fellowship activities.